Playing Ace Maverick brought back quite a few memories of playing Sega’s classic helicopter shooter Thunderblade as they are both tough, uncompromising heli shooters that put your piloting skills to the test. They both mix skilful flying and swarms of bullet happy enemies with tons of player deaths. The premise of Ace Maverick is simple. 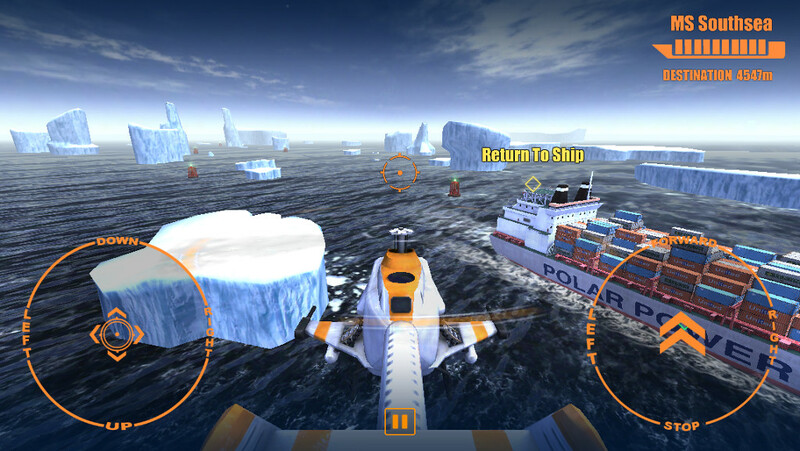 Pilot your helicopter using on screen touch pads – direction and power – to protect your cargo ship from icebergs and enemy gunships across seven challenging levels. 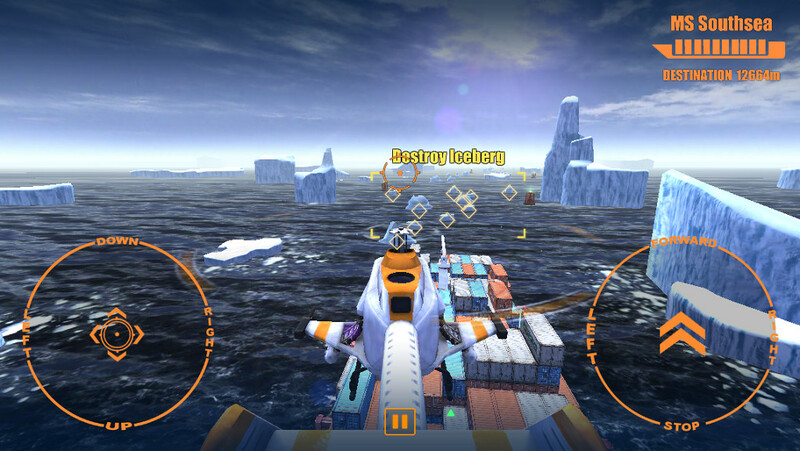 At the start it’s all about mastering the controls while blasting away the tons of variously sized icebergs. I use the word master as it took me a fair few levels to be adept enough not to ditch my chopper straight into the water, ice or into my own cargo ship. Several my early fatalities were from the ship ploughing into me. There is an audio collision warning but that mostly startled me more into the ship and hastening my death. After the third mission my piloting skills were really being stretched. Instead of just clearing the icebergs I had to take on enemy gunboats and helis hell bent on stealing my ship’s cargo. It was a real balancing act between clearing out icebergs, protecting the ship from the annoying cargo stealing enemy helis and avoiding the bullets from the waves of gunships. It became a massive achievement just finish a mission and my nerves were pretty much shredded. There is a lovely final challenge in store at the end of each mission as I still had to land my heli back on the moving cargo ship. Crash and I’d have to restart the mission, again. Ace Maverick looks absolutely amazing. The arctic landscapes are wonderful and even include the odd polar bear or two. The downside to all this graphical splendour is you need at least an iPhone 5s or iPad Air to play. The game also eats battery life for breakfast and made my iPhone really hot after playing for 20mins. But the onscreen controls work really well even on my iPhone 5s small screen and my sausage fingers. At the moment there are seven missions available, of which the later take some serious beating. 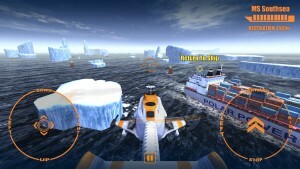 There are mission bonus objectives such as protecting the ship from all attacks or clearing every iceberg which do prolong the game. Otherwise, if you’re really good you can complete it in a few hours. However, according to Futureworks Studios, there’s two additional seven mission packs in the works to complete the story. Both of these will be released for free and there will be more mission packs if the game is successful. Overall, Ace Maverick is a tough, beautiful heli shooter that rewards practice and perseverance. It’s also more fun than Thunderblade and ideal for playing while commuting in short, instance bursts of gameplay. Ace Maverick is available now on the App Store for £3.99.